RunTri: Meb Keflezighi's Amazing Boston Marathon Victory: Why Did Other Exceptional Runners Lose? Meb Keflezighi's Amazing Boston Marathon Victory: Why Did Other Exceptional Runners Lose? 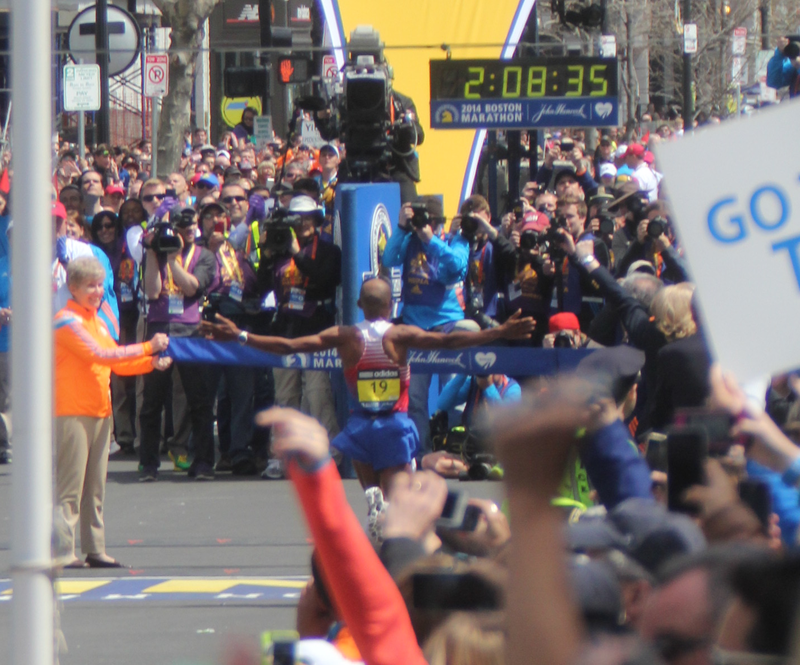 Boston Marathon 2014: One of the Greatest Marathon Victories of All Time? Meb Keflezighi's Boston Marathon win has been called 'a Run for the Ages' and some have even called it one of the greatest marathon performances of all time. Meb ran the best race of his life, and that's saying a lot. He was steady, ran his planned race without hesitation, delivering the fastest marathon time in an outstanding career that's included winning the 2009 New York City Marathon and earning a gutsy come-from behind Bronze medal at the Olympic Games. I have tremendous respect for Meb, Ryan Hall, and all the monumentally impressive top 20 elites who came to race Boston this year. This was an emotional marathon, a year after terrorism shattered the race, and Boston 2014 was the year we were going to take the race back. And nothing would be more perfect than for an American to win for the first time since 1968. Boston's 32,000 runners and up to one million spectators did indeed take the marathon back, and Meb's victory was the type that legends are made of. A storybook ending, absolutely classic, almost an impossible outcome. As a veteran of 13 consecutive Boston Marathons, and now a reporter/photographer covering the race, I'm thrilled with the result. Boston is legendary. For me Boston is personal. It's the greatest marathon in the world. 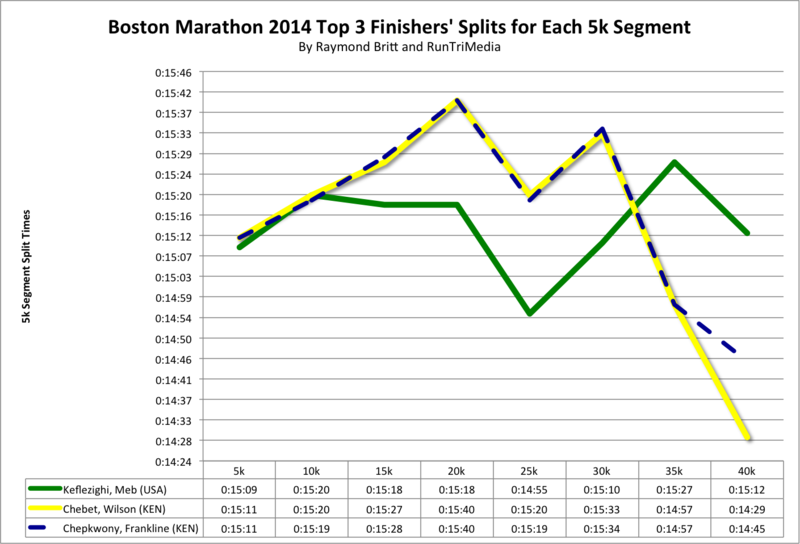 Boston Marathon 2014: One of the More Stunning Losing Performances of All Time? However . . . As an endurance racing statistician who's analyzed hundreds of races in detail, and as a journalist who's been present to witness some of the other, great, defining marathon performances in history at Chicago Marathon, New York City Marathon and US Olympic Trials, the numbers or explanations surrounding the American's victory or the Kenyans' and Ethiopians' poor performances just didn't add up. 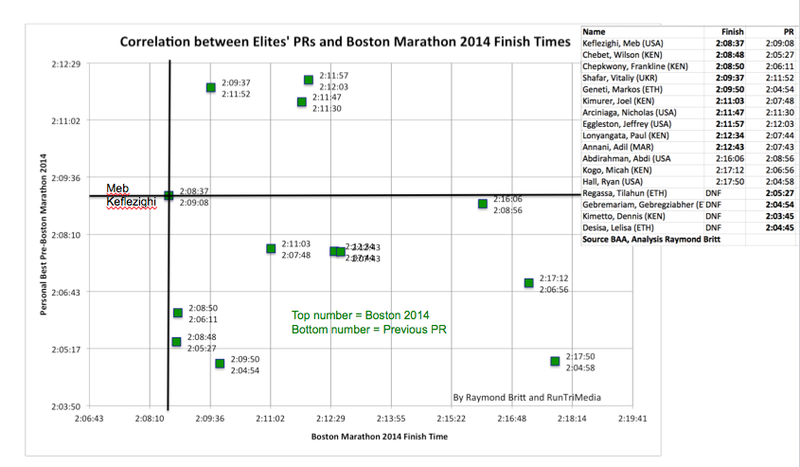 We dove deep into the numbers of the elite runners, comparing PRs vs Boston finish times, mapping Top 10 Runners at every checkpoint, and specifically analyzing the top 3 finishers, including Chebet, who had charged to close the gap to 8 seconds from Meb before it stunningly all fell apart. Here are the questions we posed, and our resulting analysis. 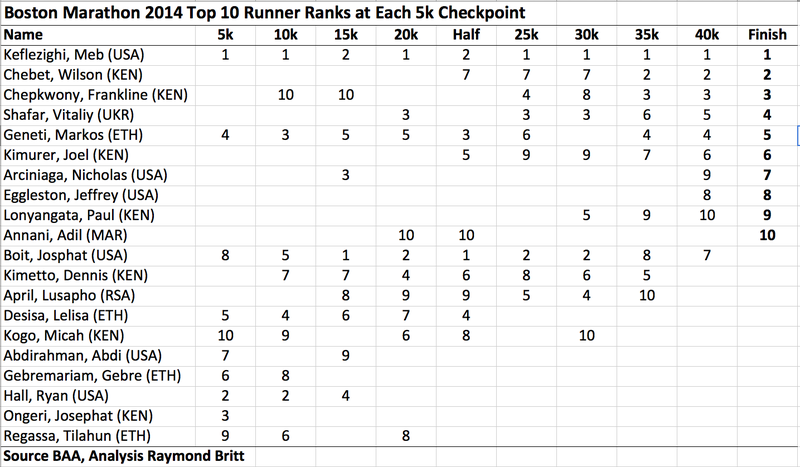 Of 17 elites coming into the race with, for the most part, dramatically faster PRs than Meb, why did many of them deliver shockingly poor performances? Why did 4 of the fastest marathoners in the world, including the defending champion, drop out of the race before finishing? What are the odds? So close, but too tired? Chebet came back with a tremendous surge, only, in his agent's word, to become too 'tired' to reel Meb in at the end.